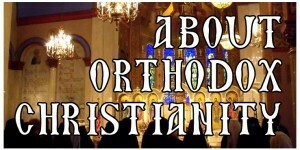 This page gives an introduction and answers some of the most common questions about the differences between Evangelical Protestant Christianity and Orthodox Christianity. If you have a question that is not answered here, or want more in-depth information, please contact us. You may also find some helpful information comparing Orthodoxy with Evangelicalism in our pastor Fr. Andrew Stephen Damick‘s “Orthodoxy and Heterodoxy” in either its podcast or book form. To say that Orthodox Christian worship and life are markedly different from nearly anything seen in the numerous worlds of Evangelicalism would be an understatement. For some first-time visitors from Evangelical circles, Orthodox worship can even be shockingly different. Even for those whose first experience with Orthodoxy is not as jarring, it will still be exceptionally unfamiliar. Perhaps what is most important to know about Orthodox worship for the Evangelical is that, unlike most of what may be familiar to them, the key elements are not teaching and emotion, but rather mystical union with God. There is still teaching going on, and there’s nothing wrong with experiencing emotions. Yet because Evangelicals may be so used to church functioning along those lines, the liturgical atmosphere of Orthodoxy can often be bewildering to those used to receiving a lesson or feeling an emotion in church. When Orthodox Christians gather for worship, they come to commune with their God. Why do we do things that way? It’s because this is how worship was conducted in the first century Church and how history records Christians continued to worship for centuries afterward. Orthodoxy is very much concerned with holding fast to what was received from the Apostles and passing it on faithfully from one generation to the next. The idea that the Church should fundamentally change its worship according to the tastes and culture of the world is foreign to us. Thus, while Orthodoxy has an ancient and robust intellectual tradition, the intellect is not the primary means of contact in worship. Nor is the emotion that characterizes “contemporary” Christian worship primary in Orthodoxy, even though its hymnography and symbolism can be very moving. Rather, there is something that we believe is much deeper going on—the union of God with man. To be accurate, we pray with the saints, not to them. Much the same as you would ask your friends, family or other Christians to pray for you, we ask the saints to intercede on our behalf. It’s important to remember that the saints who are in paradise are alive, and because they are alive, they are able to pray for us! They are also aware of what we are doing here in this life, for, as the Scriptures say, we are “surrounded by a great cloud of witnesses” (Heb. 12:1). We don’t pray to the saints “instead” of to God, just as any Christian does not ask his fellow Christians to pray for him instead of going directly to God with his concerns. Rather, we enlist them along with the rest of the Church to pray to God to hear us and have mercy on us. No saint would ever get between anyone and God. Rather, they always pray for us to God so that we can become one with Him just as they did. Icons are in some sense our family album. In the same way that many people keep photo albums to help them remember people and events, we keep the icons to remind us of people and events. They adorn the walls of our worship spaces, making that “great cloud of witnesses” more apparent to us. Most Orthodox Christians also have an icon corner in their home where they display icons of Christ, the Theotokos (a Greek word meaning “Birth-giver to God,” i.e., the Virgin Mary) and other saints and scenes from Scripture. Why is she so important? Mary stands witness that Jesus Christ is fully human, even while being fully God. The early Christians made a point of inserting into the Nicene-Constantinopolitan Creed (AD 325) the statement that Christ was “incarnate… of the Virgin Mary” to ensure there was no confusion on this matter. As for prayers, we pray with Mary, and ask her to intercede on our behalf. It’s no different than asking your own mother to pray for you. And in this case, we’re asking Jesus’ mother to pray for us. As shown at the Wedding at Cana in Galilee, when Jesus turned water into wine at His mother’s request, her prayers to Him are indeed efficacious (John 2:1-11). Making the sign of the cross is not unique to Orthodoxy—Roman Catholics also make the sign of the cross, as do many Protestants, including Anglicans/Episcopalians and some Lutherans (including Martin Luther himself). Our hymns and prayers change every day. Yes, there are some hymns we sing regularly, but each day different hymns are sung to celebrate a feast, the life of a saint or some other event in the life of the Church. If an Orthodox Christian participates in Vespers (evening prayer), Matins (morning prayer) and the Liturgy, dozens of different hymns will be heard! And even with the ones that are repeated at every service, very often verses appropriate to the day are inserted between the standard verses that we sing. Like most churches, we have a large and varied hymnbook, and some of the hymns and prayers are used more than others. But because the Orthodox liturgical tradition is so vast, full immersion in it provides an almost endless variety of exploration and possibility. And Orthodoxy contains within its worship life the full theology of the Church, something that is not frequently seen in many Evangelical Protestant churches, where you would have to look up official statements on doctrine to get the full picture. Specifically, we fast each Wednesday to commemorate the day when Jesus was betrayed and each Friday to commemorate His death on the cross. In addition, we fast during the entire Lenten period and the entire Advent period, as well as other times during the year. There are several ways to approach this. Although Orthodox Christians certainly recoil at the sacrilege of testing it using the scientific method, it is likely that one would find only wine, water and bread with such tests. And to some folks, that might settle the question. But does it really? We don’t think it settles the question at all. It’s not really even the right question. The Eucharist is truly the body and blood of our Lord. But this can be apprehended only by spiritual sight, what the early Christians called the nous—the eyes of the soul. Without this spiritual insight, we could not understand the mystery of the Eucharist. To address a question that often arises, we do not view the Eucharist as a “re-sacrifice” or a “re-presentation” of the Sacrifice of the Cross. Rather, in the Eucharist, the Church is brought up to heaven to participate in the heavenly communion that finds its origins in the one sacrifice of Christ on the cross, which continues to be efficacious throughout all time. Much of the content of Orthodox worship services consists of readings from the Scriptures, especially the Psalms. Readings from the Gospel occur at most services, along with regular readings from the Epistles. There are not now, nor have there ever been, any restrictions on the laity with regard to reading the Scriptures—they are, and always have been, encouraged to read them. As for Sola Scriptura, we believe that the Scriptures are the “canon”—the measuring stick—which must be applied to all doctrine, but it is not the only source doctrine. In other words, not all doctrine is found in the Scriptures, but no Orthodox doctrine contradicts the Scriptures. Does tradition override the Scriptures? Some place Scripture and Tradition in opposition to each other, but this is not the Orthodox position. Others place Scripture and Tradition on the same level and set them up as co-equal, but neither is this the Orthodox position. For Orthodoxy, there is but one deposit of faith that contains everything that God has given to the Church via the Holy Spirit. The Scriptures are part—the central part—of this deposit of faith, and thus are part of Holy Tradition. The Scriptures are not “overridden” or “trumped” by tradition, but are the cornerstone of tradition. They are the canon by which all doctrine must be judged. No Orthodox teaching is in contradiction to the Scriptures, nor can it be, for if it is, it most certainly could not be part of the deposit of faith and is therefore not Orthodox. The Holy Scriptures, as interpreted by the Church, have the final say over any and all matters of faith and practice. They do not have the only say (see II Thess 2:13, 3:6-7; I Cor. 11:1-2; II Tim. 2:1-2; I Tim. 3:14-15). The Scriptures are themselves a product of the oral tradition of the early Church. The Gospels were preached orally, later being written down by the four Evangelists through the leading of the Holy Spirit. One can also see in the Gospels of Luke and Matthew usage of the Gospel of Mark—the use of prior tradition. The use of oral tradition in the Scriptures has precedents in both the Old and the New Testaments—the authors were simply following accepted practices. Similarly, both Luke and Matthew had access to some collection of sayings that they used in common which do not appear in Mark. This collection could have been oral, written or a combination of both. Questions and answers expanded and adapted from “For Protestants” and used with permission from St. Peter & St. Paul Orthodox Church, Burr Ridge, Illinois.